Chanukah is often a presented as a “not very important” holiday. Common wisdom has it that Chanukah only receives attention because it occurs in the same season as non-Jewish holidays. Nothing could be further from the truth. In fact, Chanukah (and Purim), we’re taught, will be the leading festivals in the time of the Geula, the Earth’s full redemption. The lights, the singing, the spinning dreydles; the sizzle of latkes, sufganiyot (donuts), bimuelos, and other myriad fritters; the publicizing of the 8-days of lighting, are all precious, but there’s more. 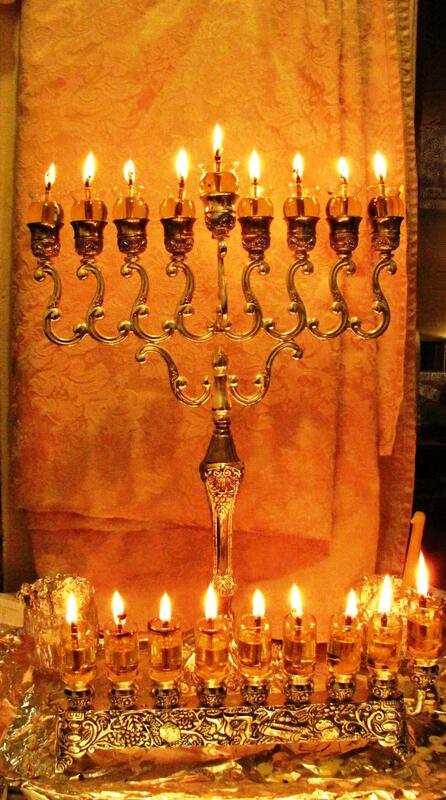 The radiant lights of Chanukah have the power to awaken us and draw even those who are far away near to Hashem. When we do the holy mitzvah of lighting the menorah, we merit a new understanding, a deep awe, of the holy Creator and Sustainer of the Universe. We are also blessed with Shalom, peace, at home. Shalom between husband and wife, children and parents, and beyond. The lighting of the candles also enhances our ability to connect to Hashem with honest words of prayer, direct from the heart. So when you light the candles you are helping create world peace. When you say Happy Chanukah to someone, you are wishing them a share in that peace.